When exploring AdWords management opportunities, Dynamic Search can be an effective supplement to conventional keyword targeted campaigns, especially in a business where you routinely have new product listings or items temporarily changing in availability. In this type of environment, along with the fact that search behavior can be a moving target (on average 15% of search queries each day have never been seen before by Google’s Search Engine), even well managed AdWords campaigns containing thousands of keywords can miss potentially relevant searches, experience delays in creating ads for new items, and become temporarily out of sync with the full range of products available on your website at any point in time. Dynamic Search Ads are a great way to target relevant searches with dynamic ads generated directly from your website content. A well-structured Dynamic Search campaign can effectively complement your existing keyword targeted ads to achieve broader coverage across all of your products and generate incremental sales. Google maintains an active index of your products using their web crawling technology. Whenever a relevant search occurs that is not already covered by a conventional keyword-targeted campaign, Google dynamically generates an ad with the headline based on the specific search query and brings traffic to the most relevant landing page identified through their product indexing. This allows for more comprehensive exposure on your product inventory without disrupting your existing keyword campaigns. You can choose to target your whole website, specific categories of products, or even pages containing certain strings within your URL. Traditional keyword negatives can be used to help refine your targeting and prevent coverage on specific products or categories that you may not want to advertise. Dynamic Search Ads can generate incremental sales by promoting your products on a broader range of search queries than you’re currently covering today. 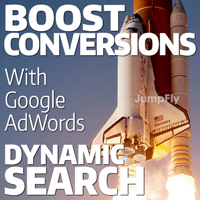 Even well managed AdWords campaigns containing thousands of keywords still have the potential to miss some relevant searches, so expand your reach with Dynamic Search to help ensure the most comprehensive level of product coverage and bring shoppers to the landing pages that deliver exactly what they searched for where they are more likely to convert.